The ORIGINAL Oakley™ X-METAL Repair Service! The X-Man is your premiere source for Oakley™ repairs and refinishing. 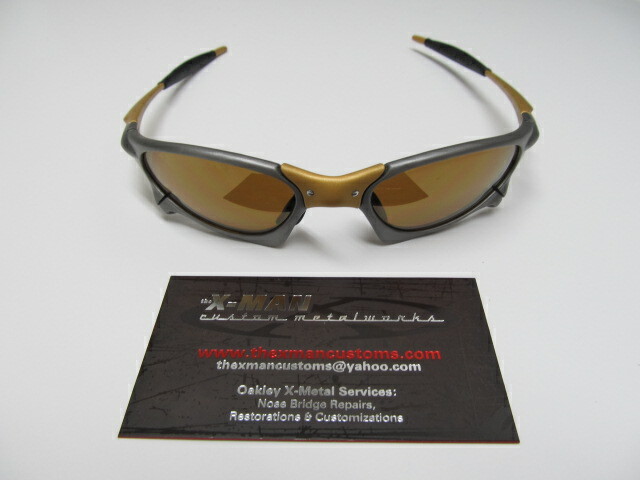 If your Oakley™ sunglasses are in need of a tune-up The X-MAN can make them as good (or better!) than new. If you want to change up the look of your Oakley™ frames, The X-MAN offers custom refinishing including Cerakote Coatings applied by fully factory trained painters. Need your sunglasses back fast? The X-MAN finishes Tune-ups the same day, refinishing in 2 days and returns via Priority Mail including free tracking! Want more proof of The X-MAN's stellar service? Just check out our Gallery and read the Testimonials from many satisfied customers. Contact The X-MAN for the list of Cerakote colors and Linegear replacement parts currently available. Did you know the X-MAN can fix stripped screws in your X-Metals? Drop us a line for more info.